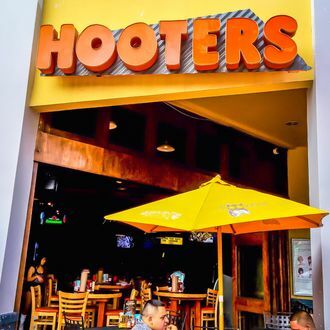 Hooters has decided, in our current cultural moment, that it should probably push delivery as a way to covertly eat the chain’s acclaimed food without the baggage of having to physically enter one of its breastaurants. Hooters’ sales have slipped in recent months, and apparently CEO Terry Macks feels that by focusing on delivery, hungry but suddenly sheepish wings-eaters will warm to the chain. In fact, according to Macks, there’s no telling how much this plan might help their business: “Many people wouldn’t step foot in our restaurants, but they want our product,” he said at a retail conference this week, according to the New York Post. Delivery therefore solves “the polarizing issue the brand has had” — or, well, at least one of them. It still ignores the dicier problem of whether it’s okay to support an atmosphere where workers sometimes get photographed without consent, groped, or even stalked because you can now order the products anonymously. But data supplied by Hooters shows that the delivery push is kind of working: Orders are up by almost a third this year, and the number of locations with delivery has climbed from 7 in 2016 to 96. Just so everyone’s clear: The delivery people aren’t Hooters Girls. That job will typically fall on GrubHub, DoorDash, or UberEats. The Post adds that Hooters is also cleaning up brick-and-mortar restaurants, perhaps as a backup plan. They offer a “smoked” wings option now, have more craft beers on tap, and sport renovated exteriors. The façade’s drab old strip-club look has given way to walls of glass windows. Macks says that’s so people passing by who’d ordinarily roll their eyes will now see “how much fun” everyone inside is having.